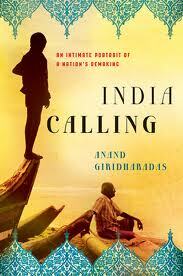 I’ve only been here a short period of time, but I can’t stop talking about Anand Giridharadas book India Calling to everyone I’ve been meeting since I arrived. I wonder if it’s a book that is useful for people who are from India, or if it really is a book for Westerners – particularly of Indian descent. Anand’s parents are originally from India obviously, but he was raised in the suburbs of Ohio, and went to Mumbai/Bombay to work after graduating from the University of Michigan. His book is partially an autobiography between his American and Indian worlds, and partially an examination of the larger socio-economic transitions taking place in India. There’s a good article about it on NPR’s website. The book gives a useful context to my experiences here, and really deepens my understanding of the massive changes that are happening all over this country and the effects it is having on the people I’ll be working with. on our understanding of what fair trade is all about.